I don't think I can let today pass without mentioning a truly remarkable achievement in the music world. 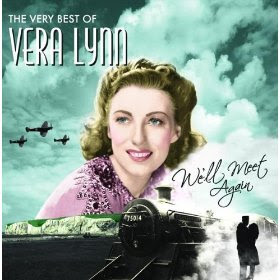 Last week Dame Vera Lynn topped the British Album charts with her album We'll Meet Again, a collection of her songs spanning her lifetime in music. At 92, she is the oldest living performer ever to have held this position. What's more, Vera fought off the likes of The Beatles and The Artic Monkeys to take the No I spot and in doing so took the honours away from Bob Dylan who, at the tender age of 67, achieved the same feat earlier this year with his album Together Through Life. The song We'll Meet Again, after which the album was titled, was still a very popular song when I was a child. It was first released in 1939 but such was its potency that on my last day at comprehensive school my entire class sang it. Of course, the real sentimental attachment to the song comes from its association with WWII during which Vera, and her song, became firm favourites with the armed forces. Possibly, my generation is the last where We'll Meet Again will remain entrenched in our psyches. We are the last generation whose grandparents or parents fought in WWII. Our childhoods were full of personal recollections narrated by aging relatives, Sunday afternoons glued to documentaries like World at War (morosely narrated by Laurence Olivier) and evenings transfixed by television adaptions of novels like A Town like Alice and The Winds of War and films like The Guns of Navarone and Cross of Iron. The War, and all that it stood for, was still very much part of our recent history and, as a consequence, we were never allowed to forget the sacrifices that were made to ensure our feedom and liberty. So the sentimental attachment to We'll Meet Again, a forces favourite, was actually still quite profound in my youth. But the sad reality of WWII was that meeting someone you loved again had the odds stacked against it. Relationships were often brief and painful, duty came before love and marriage and frequently a telegram on the doorstep would put an end to thoughts of any sweet reunion. But of course the role of a Forces Sweetheart is to serve as a morale booster to armed forces in time of conflict. A role which many performers took, and still take, very seriously. Their job is to inspire as well as entertain and We'll Meet Again which ends on the words "And I know we'll meet again some sunny day" typifies this optimistic and encouraging outlook more than any other wartime song. With the likes of (They'll be Bluebirds Over) The White Cliffs of Dover and When You Wish Upon A Star Vera Lynn has become the ultimate Forces Sweetheart. Initially, she competed with the likes of Gracie Fields and Anne Shelton but her longevity and the overriding success of of We'll Meet Again has meant that she has never relinquished the title. The current favourites Katherine Jenkins and Hayley Westenra might have all the big frocks and glamorous looks but you know what? The minute i heard about that album, I wanted to get it. I've heard so many of her songs from my mother. I've also read a great many books about WWII, enough to know what people like her meant to the troops. That clip made me cry! Nice one, Mrs T. Strangely - or not - this has always been one of my favourites. OMG I remember listening to this on a BBC serial called "From Ragtime to RocknRoll ages and ages ago.